Martelli Spaghetti for sale. Buy online at Zingerman's Mail Order. Gourmet Gifts. Food Gifts. The Martelli family makes these pastas in the tiny Tuscan town of Lari, which is on the way to nowhere and out of the way from everywhere. 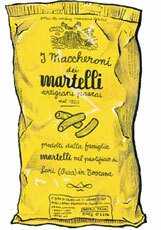 Only Martelli family members create the pasta, which is why there are only four shapes. Or at least there used to be only four. For nearly one hundred years the Martellis only made spaghetti, spaghettini, penne and maccheroni (the maccheroni we use for our Roadhouse Mac and Cheese). It was one of the constants in life that I could always count on. Every new year there would be a total of zero innovations at Martelli. Then a few years back they brought out fusilli, the screwiest, cork-popping shape in the pasta pantheon. I'm not sure what to think, except to say it's delicious. The Martellis do everything right that most commercial pasta makers do wrong. They insist on using only the hardest durum wheat flour, extrude their pasta through traditional bronze dies, which makes the pasta grip the sauce, and take their time drying the pasta. Commercial producers dry their pasta in a hot blast furnace in a matter of minutes. With Martelli, it happens in a warm room over two days. Time is the key, since the slow dry makes the texture more chewy and the flavor more intense, the taste more like bread than raw wheat. Cook Martelli in heavily salted water till it's al dente, just slightly firm. If it's your first time trying it keep the recipe simple: return it to the pot, and add just a bit of good olive oil or butter, some grated Parmigiano Reggiano and freshly ground Tellicherry Pepper. "I've been reading your effusive description of Martelli Pasta for years, and didn't think it could possibly be that different from normal pasta. I was so wrong! The chew and texture of this slow-dried pasta is superior to all others on the market. Thank you for bringing it into my life!"